Brad Pitt and Angelina Jolie are reportedly looking to expand their family by adopting a child from war-torn Syria. A business associate of the Hollywood power couple told the UK’s Daily Express that Jolie has been emotionally affected by the conflict raging in Syria. A new child would bring the Pitt-Jolie brood to seven; the couple already has 13-year-old Maddox, from Cambodia, 11-year-old Pax, from Vietnam, 10-year-0ld Zahara, from Ethiopia, biological daughter Shiloh, 8, and twins Knox and Vivienne, 6. Last month, Jolie underwent surgery to have her ovaries and fallopian tubes removed due to her family’s history of cancer. Two years ago, the actress underwent a double mastectomy. Jolie’s mother, Marcheline Bertrand, died from ovarian cancer in 2007 at age 56. The civil war in Syria has spawned another civil war in the global jihadist movement, with Islamic State, ruled by Abu Bakr al-Baghdadi (l.), and Al Qaeda, led by Ayman al-Zawahiri, (r.), emerging as sworn enemies. Syria’s bloody civil war has spawned a separate rift with ramifications well beyond the region known as the Levant -- a battle for the very soul of the global jihad movement. Islamic militants who poured into the embattled nation to help the Free Syrian Army in its bid to topple dictator Bashar Assad are now fighting Assad, the rebels and each other in a barbaric free-for-all. At the center is the split between Al Qaeda’s regional affiliate, Jabhat al-Nusra, and the newly emerged Islamic State, which are fighting each other on the battlefield and in the war for recruits to the cause of Islamic terrorism. “The two groups are now in an open war for supremacy of the global jihadist movement,” according to Middle East scholar Aaron Zelin in a research paper published by the Washington Institute for Near East Policy, a U.S.-based think tank. Throw in the jihadist-led insurgency in neighboring Iraq, which has become intertwined in the insurrection in Syria, and the shifting alliances are becoming for many even harder to understand. Last week, Al-Nusra, struggling to stay relevant and recruit fighters, released a video featuring three of their fighters as they head off in northern Syria near the city of Aleppo to battle the Islamic State, which was disowned by Al Qaeda. The message was that they, not Islamic State, have the purer motives. Another fighter urges Islamic State fighters to defect and “return to the truth” by joining Al Nusra, which is aligned with several Islamist rebel militias in Syria and has been fighting against the Islamic State since last winter, when Al Qaeda leader Ayman al-Zawahiri disavowed Abu Bakr al-Baghdadi, the boss of the upstart group then known as ISIS. “Al Qaeda announces that it does not link itself with [ISIS] ... It is not a branch of the Al Qaeda group, does not have an organizational relationship with it and [Al Qaeda] is not the group responsible for their actions,” the terror network’s General Command declared. The pointed disavowal sparked mass defections from Al Baghdadi’s burgeoning operation. Jihadist and rebel groups eager to avenge ISIS assassinations of their comrades, took it as a sign it was open season on ISIS. But Al Baghdadi, whose mentor was Abu Mousab al-Zarqawi, a Jordanian militant who himself was rebuked in 2005 by Al Zawahiri for excessive extremism in Iraq, clawed back. The success Islamic State, as it is now known, has enjoyed since is testament to his leadership skills and strategic savvy of the jihadist veterans from Iraq and Chechnya who are at the core of ISIS. By forming alliances with Sunni tribes along the border and deep into Iraq, Al Baghdadi managed to magnify his power. Some terror experts believe Al Zawahiri, Usama bin Laden’s successor as Al Qaeda chief, was too slow in identifying Al Baghdadi as a serious rival for leadership of the global jihad movement. Tensions had existed within the jihadist movement in Syria since April 2013, the year before the disavowal, and “core Al Qaeda failed to take a genuinely commanding line,” said Charles Lister, a terrorism expert with the think tank Brookings Doha Center. Some analysts view the split as having been prompted by Al Qaeda’s leadership fear that Al Baghdadi was too cruel with his beheadings, beatings and whippings and imposition of religious Shariah law on territory his men controlled. But the dispute is, in some ways, more of a generational difference and a vying for the loyalty of jihadists affiliates and offshoots around the world – a jostling that is fracturing the jihadist movement and represents the biggest challenge Al Qaeda has faced since U.S. Navy SEALs took out bin Laden. Many of the younger generation of jihadists support the Al Baghdadi idea of seizing territory and carving out a jihadist caliphate. They want their own state and have tired of Al Qaeda’s traditional approach of gradualism. Caliphate refers to a system of government stretching across most of the Middle East and Turkey that ended nearly a century ago with the fall of the Ottomans. And Al Baghdadi has been smart in his marketing – outshining Al Nusra in the use of social media to recruit and message. “Taken globally, the younger generation of the jihadist community is becoming more and more supportive, largely out of fealty to its slick and proven capacity for attaining rapid results through brutality,” Lister said. Al Baghdadi’s announcement of a caliphate in the summer straddling the border of Syria and Iraq – he has ambitions to spread it all the way west to Lebanon -- has increased his standing among jihadi groups worldwide and more foreign fighters are choosing to join him than Al Nusra. Several important affiliates have sworn allegiance to ISIS, while many others are avoiding declaring their choice between al Baghdadi or Al Qaeda, preferring to hedge their bets and wait to see who comes out on top. On the ground in Syria and Iraq, the top dog at the moment is ISIS. With the advanced weaponry it has captured from fleeing Iraqi forces and the money it looted from Iraq’s regional banks, it has taken over the group and has much to offer recruits. But Islamic State’s expansion has brought new battlefronts that could stretch the terror group to the breaking point. In Iraq, where it has carried out horrific executions of Christians and other religious minorities, it now faces hardened Kurdish fighters, the Iraqi Army, U.S. airstrikes and a budding international coalition and even Iran. All that comes even as Islamic State, estimated to include less than 20,000 fighters, continues to seize villages and kill enemies in Syria. If the well-funded upstart terror group hopes to stay on top of the global jihad movement, it will have to maintain its momentum. 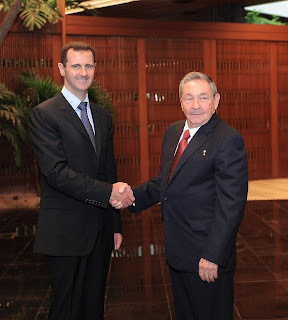 Cuando Obama “tiró el farol” (guapería oral en Cuba), contra El Assad, el criminal sirio arreció la masacre contra su pueblo y nada sucedió. El papelazo se olvidó por el control del comunismo demócrata de la media nacional; hace poco le hizo una advertencia al gobierno “que se huyó” en Ukrania y ese pueblo, que entendió el “gesto-declaración sub-amenazante” como la posibilidad de ningún apoyo al reclamo libertario, incendió la capital literalmente, como los moscovitas a Moscú cuando la invasión napoleónica, quedando demostrado que el tipo no solo es pusilánime, sino aliado de las fuerzas represoras que asolan a cualquier pueblo del mundo; que ni mete miedo ni es su intención; pero, para mal de Estados Unidos, cada vez menos de los que reconocieron a este país como suma y reflejo del destino y la esperanza de quienes buscan apoyo para recuperar la libertad perdida, creen en él. Con semejante capitán al frente no puede resolverse con justicia una bronca en kindergarten. Parte del incremento de la pérdida de espacios de la llamada democracia es culpa de este antiamericano y comunista que habita en la ex Casa Blanca. Los venezolanos deberían tener en cuenta el caso cubano otra vez, porque, con mil y una artimañas (tal vez le quede mejor marañas), una parte muy generosa de ambos partidos han contribuido a enquistar la tiranía dictatorial castro-comunista, tomando en cuenta que, en 55 años, han pasado 5 presidentes republicanos ¿Y? Aunque vale la pena decirlo, por lo menos los republicanos hablan, prometen, engañan piadosamente (con intención electorera claro), a sabiendas de que nada harán por el país, como los congresistas cubanos y Marcos Rubio; pero se prefiere eso a la actividad abiertamente pro-tiranía, tal el apoyo político-económico de Obama con los viajes, las remesas, los intercambios y lo que cuelga y falta. De Capriles: “seguirán las protestas hasta que se escuchen las demandas...”, por lo que he sabido ¿A quién se dirigió? “EL PAPA NO TIENE DIVISIONES”, ni el “raro” pacifista seguidores, digo, eso creo. Si el objetivo INCLUYE “conversar” con quien los desconoció al pedírselo a Obama para que “no lo tumben”, esa protesta, con muertos y heridos, terminaría en un desastre; sin embargo, creo que los jóvenes en Venezuela, que no son como los de la Cuba castrista, tienen más lucidez y arrojo que los “mayores”, porque, a fin de cuentas, arriesgan más porque no tienen que buscar la comida de un hogar, y por la propia naturaleza juvenil cuando son nacionales con identidad y el sentimiento patriótico latente para luchar por su independencia y soberanía. Hoy se inauguró en Miami un monumento solemne a la memoria de parte de los últimos niños y jóvenes que nacieron en Cuba, es un mausoleo de cálculo, porque nadie puede cuantificar cuántos jóvenes cubanos murieron en los primeros 7 años de genocidio castrista en acción, asesinados sin juicio o en paredones de fusilamiento, etapa capaz de convalidarse con el arrojo y la necesidad de la juventud venezolana en la calle, pero con muchos más muertos, presos y desaparecidos que, por la apatía o por la militancia castrista del “hombre y el joven nuevos”, han quedado en el plano de víctimas inútiles por un sueño roto: la libertad de Cuba. Pero en Venezuela, porque el capitalismo y la sociedad de consumo se han mantenido vivos aunque en peligro, donde todavía pueden ver a los Yankees por televisión y a Miguel Cabrera con el Detroit; o comprar un juego de video que no sea la “lucha heroica de Fidel o de Chávez por el pueblo”, incluso gustos a tono con su edad como disfrutar un concierto de un nacional que viva en Estados Unidos y no sea chavista, a fin de cuentas, hay diferencias. Sin embargo, para que no pierdan en el round 12 por TKO, deben seguir en la calle y quemar lo que vean, así provocaron la huida del sátrapa en Ukrania y obviar lo que diga el partido demócrata o quien sea, porque, si la tiranía castro-madurista cierra el candado, esa llave no la encontrarán más nunca. Por cierto ¿Cuántos mexicanos, aquí o allá, se están solidarizando con Venezuela como "hermanos" exigen para marchas intimidantes por su “reforma migratoria”? incluso de todo Centro y Suramérica y hablo de pueblo, no de gobierno. Joe García, que ni pinta ni da color y cuyo puesto como congresista es un apéndice para molestar al exilio y bacilar sin ninguna capacidad legistativa de efecto positivo; que nunca está en la base correcta para anotar con fly de sacrificio, sugirió lo que entendí como la política del partido demócrata, ala obamista, para resolver el problema venezolano: hace un par de días este “headknuckles” (“CABEZA HUECA”, tratamiento a lo MOCHELLE), propuso “conversar sobre la habilitación de un Ajuste Venezolano” que dirima el asunto a favor de Maduro y de Raúl, en un momento en que ese país necesita la 82 División Aerotransportada en “terreno de nadie”, por el bien de Venezuela y del resto de Hispanoamérica. An image touted as that of an orphaned Syrian boy sleeping between the graves of his murdered parents has been sweeping through social media and is being used to decry the deteriorating situation in Bashar al-Asaad's country. But it turns out that the photo is a hoax. The photo depicts a boy wrapped in a woven blanket and sleeping between two six-foot long piles of stones resembling graves. Larger rocks appear at the head of each pile, completing the impression that the rubble could be graves. The photo often appears with a headline or caption leading viewers to believe that this is an orphaned Syrian child that has lost his parents in the unrest there. The truth, however, is that the image is a staged photo, the pile of pebbles merely that--a pile of pebbles--and the boy the nephew of the photographer and not an orphan at all. Even more absurdly, the photo was taken in Saudi Arabia, not Syria. The creator of the photo cannot be blamed for this propaganda. Abdul Aziz al Otaibi, a photographer from Saudi Arabia, has made it clear that he is quite upset that people have appropriated his image for a Syrian propaganda campaign. Photographer al Otaibi has explained that he intended his photo to be art, not propaganda. As reported by Harold Doornbos, al Otaibi was trying to make an artistic statement about a child's love for his parents. "I love photography," al Otaibi told Doornbos by phone. "Every artist has ideas in his head. So I had the idea to make a project whereby I show in pictures how the love of a child for his parents is irreplaceable. This love cannot be substituted by anything or anybody else, even if the parents are dead." Early in January, the photographer posted the image on his own Facebook page explaining clearly what his purpose for the image was and that it was a staged photo featuring his nephew. But, much to his chagrin, that didn't stop those who decided to appropriate his photo to turn it into Syrian propaganda. "I am really very annoyed by this," al Otaibi said. "It is just not fair to take one of my photos totally out of context and use it for your own propaganda." This is all too common in the Middle East, unfortunately. In fact, some terror outfits--especially in the Palestinian territory--have special propaganda units geared specifically for making false photos and videos depicting fake attacks on their people. The photos and videos often show dead children to elicit sympathy from the outside world. Such images are sometimes called "Paliwood photos." The most famous fake video depicting the death of a Palestinian child was the case of one Muhammad al-Dura, a little boy supposedly killed by Israeli military forces. For years the fake video and image was used by western media outlets to malign the Israelis, but it was ultimately shown to be a fraud. In 2008 the photo and video was even the subject of a major court case of media bias against the government-controlled French media. Only a few years ago, CNN's Anderson Cooper was fooled into using another faked video of Palestinian "victims" in his reporting. The rapid rise of an al-Qaeda affiliate fighting alongside rebels in Syria may be coming to an end as backlash against more extreme jihadists grows. The Syrian rebel Kawa Khalil told me the recent story of the Holy Cross church. Before the war, the church doubled as a school, attended by Muslims and Christians. After the destruction of Syria began, classrooms became homes for refugees. On 27 October, the Holy Cross Armenian Orthodox Church was burned in Tal Abyad, Raqqa, Syria. The attack was blamed on the Hamza Brigade of the Free Syrian Army (FSA). Mr. Kawa Khalil reports that the day after the burning, al Qaeda came onto the streets blaming the arson on the FSA. He stated, however, that al Qaeda committed the crime. When a similar attack occurred in nearby Raqqa, other Muslims came onto the streets to apologize to Christians, saying they are not like this. The crowd tried to right the cross but it was too heavy. A video of the Raqqa apology was posted online. Despite their long history, some believe the days of Christians in Syria are fading. Many have fled to Turkey, possibly having already spent their final days in their homeland. The targeting of Christians is often not the result of religious differences. Politically, some targeting stems from many Christians siding with Assad’s regime, fearing an inevitable pogrom. Assad nurtures Christian fears to gain their support. But that hardly matters: if they side against Assad, his forces will also attack. The price of being a minority can be dammed if you do and dead if you don’t. In the ultimate “you are with us or against us, “ there is no option to play Switzerland and pretend lofty neutrality as if that were a choice. Alpine geography and political circumstance afford lucky Switzerland the fantasy of being above it all, yet a desert village on key terrain and crucial routes has less fortunate geography and circumstance. The options are to run, surrender, or fight. A Syrian Christian told me that he supports the revolution while other Christian members of his family support Assad. Pick your destiny. He moved to peaceful Turkey to resist through other means. AQ will not allow people to smoke, yet impolitely wears suicide belts in the vegetable markets. Talk about open carry. Read the rest of the story at Michael Yon Online. Learn more here. Israeli military forces destroyed a cache of Russian missiles that the Syrian government was reportedly prepared to deliver to the militant group Hezbollah, U.S. officials confirmed Thursday. The officials stressed that the surface-to-surface Russian-made missiles were under Syrian military control in a stockpile at a port near the Russian naval base at Latakia. The officials said this attack is expected to follow the usual pattern of several other Israeli strikes against Syrian missiles that were apparently on their way to Hezbollah – neither the Israelis, Syrians nor Hezbollah are likely to acknowledge the missiles ever existed or the strike ever occurred. Hezbollah is believed to have an arsenal of tens of thousands of rockets and missiles in Lebanon, much of the weapons coming through Syria. Hezbollah has controlled the Lebanese government for years and this spring joined the effort to defeat rebels trying to overthrow Syrian President Bashar Assad. Hezbollah's presence in Syria is said to have been a key to turning back rebel advances in a two-year war that has left more than 100,000 people dead. The Israeli Defense Ministry refused comment on the reports of the new attack, Reuters said, but Lebanon’s military reported that six Israeli jets flew over Lebanese territory on Wednesday. U.S. officials have confirmed that Israel struck Syrian missile sites in two different locations Thursday, reports CNN. The sites, one in the port city of Latakia and another in Damascus, allegedly contained surface to air missile systems said to be slated for delivery to Hezbollah in Lebanon. The strikes took out SA-8 anti-aircraft missiles, The Times of Israel reports. The SA-8 system is a truck-mounted, and highly mobile, but with low-altitude and short range capabilities. Since their marriage in 2000, Asma al-Assad, stylish wife of Syrian President Bashar al-Assad, has stood by his side through thick and thin. This, despite the fact that her husband Bashar presides over a government which Amnesty International and Human Rights Watch insist routinely tortures, imprisons and kills its political opponents. Most recently, of course, his government is accused of killing over a thousand Syrian men, women and children using chemical weapons. Asma, who is pretty and fit, is also smart. She was an investment banker at J.P. Morgan when she met the Syrian president, who was then training in London to be an eye surgeon. Now, people around the world wonder how a woman born in the United Kingdom, with a bachelor’s degree in computer science and French literature, could have stood by as her husband amassed a fortune over $1 billion while serving in public office. And how she could post Instagram photographs of her charity work while presumably hearing that her husband’s regime has used chemical gas to asphyxiate children. The answer is simple: Being pretty is no antidote to being greedy nor corrupt nor lacking empathy, even though people instinctively think it ought to be. 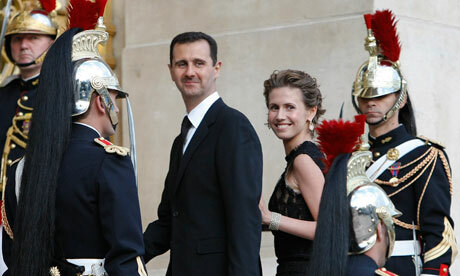 Bashar and Asma are a match made in hell because they feed one another’s needs to keep reality at bay. Being smart and educated is no antidote to being an accomplice, to being an accessory to organized crime (whether as a mafia don’s wife or a dictator’s wife). And having children is no antidote to malignant narcissism. You can be slim and wear stylish clothes and have an above-average IQ and still have such deep questions about whether you are worth anything at all, presumably because no one ever loved you for real. And then you can go about trying to fill yourself up with money, power and the adulation of others, no matter what it takes—including killing people. Bashar al-Assad may have turned out to be a decent eye surgeon if he had indulged the healer inside him, instead of being commandeered by his dictator father into dictatorship. And Asma al-Assad may have turned out to be a teacher of French literature had she not been raised in an environment that made her famished for finery and fame, such that she traded in her humanity for a palace, which only means she never grew up in anything like a home. They are a dynamic duo of destruction because they were, at some point, for all intents and purposes, destroyed in their humanness. Now they are in league to distance themselves from that reality, whatever it takes—even killing kids, which is only a stark physical representation of what must have happened to them, psychologically. Add to this the fact that a large segment of the world community has endorsed their brand of tyranny to keep another malignancy at bay -- radical Islam -- and all the ingredients for chemical weapons were stirring in the cauldron for years. Because there’s one thing about monsters that is confounding: They are sometimes ruthless at tearing down other monsters. All marriages make psychological sense, even the ones that make for mass murder. O'Reilly: Should America attack Syria? Diplomats have long employed disingenuous turns of phrase to avoid conceding inconvenient and sometimes self-evident truths that could compromise or embarrass their nations. While artfulness is preferred, bald-faced lying is also part of the protocol. When the Russian foreign minister, Sergei Lavrov, says, for instance, as he has been wont to over the past year, that Russian arms shipments to Syria’s Assad régime are not offensive in nature and mere obligatory fulfillments of old standing orders—made long before the country’s civil war—he is, most likely, lying. It is difficult to know, as yet, just why Cuba would have wished to secretly load two MiG-21 fighter jets, fifteen MiG engines, and two anti-aircraft missile systems of Soviet vintage onto a North Korean cargo ship, the Chong Chon Gang, which then concealed that cargo underneath ten thousand tons of Cuban brown sugar. But the explanation that Cuba’s foreign ministry quickly offered on Tuesday, a day after the ship’s dramatic seizure by suspicious Panamanian authorities at the Atlantic entrance to the Panama Canal, was somewhere between decidedly strange and scarcely believable. The cargo was indeed Cuba’s, said the foreign-ministry communique, consisting of “obsolete defensive weapons” which was being sent to North Korea for “repair.” If the Chong Chon Gang’s mission was as prosaic as that, then it’s captain certainly overreacted when, as the Panamanians boarded his vessel, he attempted to commit suicide by cutting his own throat, while his crewmen mounted a resistance against their captors. Check out the language used by Lavrov at the time. Russia's foreign minister said Friday he did not understand the international uproar created by Moscow's continuing weapons cooperation with regime of Syrian President Bashar al-Assad. "I do not understand why the media is trying to create a sensation out of this," said Foreign Minister Sergei Lavrov. "We have not hidden that we supply weapons to Syria under signed contracts, without violating any international agreements, or our own legislation." Lavrov said during a joint press appearance in Sochi with visiting UN Secretary General Ban Ki-moon that Russia only supplied defence weapons that could not alter the outcome of the 26-month conflict between Assad's forces and the opposition. "We are first and foremost supplying defence weapons related to air defence," Lavrov said in televised comments. "This does not in any way alter the balance of forces in this region or give any advantage in the fight against the opposition," he stressed. A 33-year-old Michigan woman was killed in Syria while fighting for opposition forces, relatives said. Nicole Lynn Mansfield, of Flint, and two other were fighters for a group opposed to Syria’s government and were killed during a confrontation in Idlib, according to a pro-Syrian government news agency. The circumstances of the deaths could not immediately be confirmed. Mansfield’s cousin, David Speelman, of Flint, told The Associated Press that FBI agents visited family members Thursday and informed them of Mansfield's death. FBI Detroit spokesman Simon Shaykhet told the AP he can't comment on the matter. 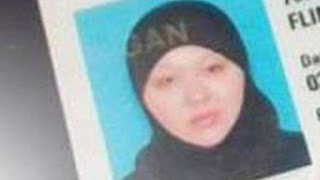 Speelman's mother, Monica Mansfield Speelman, told the Detroit Free Press that her niece was a convert to Islam who married an Arab immigrant several years ago but later divorced him. The family was not happy about Mansfield's conversion to Islam, said Monica Speelman and Mansfield's grandmother, Carole Mansfield. "She had a heart of gold, but she was weak-minded,” Carole Mansfield told the newspaper. "I think she could have been brain washed." Nicole Mansfield was raised as a Baptist and her father was a General Motors production worker, relatives said. She quit high school after becoming pregnant but later earned her GED, attended community college and worked in home health care for 10 years, they said. Mansfield, according to the Syrian government news agency report, was fighting with two other people from England and reportedly had rifles, clips of ammunition, grenades and the flag of al-Nusra, an Al Qaeda-related group. Click for more from the Detroit Free Press. The lack of integration of many young Muslims into Western countries has created the threat of domestic-based terrorism inside Europe. Now, that terrorism may be exported elsewhere. The United States has already dealt with American immigrants fighting on behalf of Al-Qaeda in Somalia. For years, the FBI has been trying to unlock the secrets of what ABC News describes as “a recruiting pipeline from the Twin Cities, which boast large Somali immigrant problems, to Somalia.” Similar phenomena have been described with regard to terrorists originating in Western countries traveling to Iraq and Afghanistan, as well. In order to prevent the same sorts of activity in Belgium, Belgian officials have participated in an anti-terror sweep designed to arrest potential terrorists wanting to travel to Syria. In Brussel, a mayor banned a Muslim soup kitchen he felt was recruiting angry young Muslims to Syria. Just as importantly, Europol, the European police agency, says that fighters who return from foreign countries after participating in terrorism “have the potential to utilize their training, combat experience, knowledge and contacts for terrorist activities inside the EU.” After America’s experiences with the Chechnyan-visiting Tamerlan Tsarnaev, Europe is deeply concerned about something similar happening on its own soil. The European hard left is attempting to stop European authorities from shutting down such travel, however. Jos Vander Velpen, chairman of the Belgian League of Human Rights, says “We are talking about views that these youngsters hold, and you cannot change opinions with a repressive approach.” That was precisely the attitude taken by the authorities with regard to the Tsarnaevs. An 18-year-old Chicago-area man accused of planning to join an al Qaeda-linked group fighting in Syria has been arrested by the FBI, the agency said on Saturday. Abdella Ahmad Tounisi of Aurora, Illinois, was taken into custody late on Friday as he prepared to board a plane at Chicago's O'Hare International Airport bound for Turkey, the FBI said in a statement. 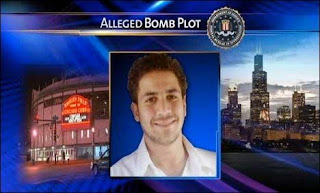 Adel Daoud, an American accused of trying to stage a bombing outside a downtown Chicago bar last year. The agency said Tounisi had not been involved in that plot. Tounisi appeared before a U.S. magistrate on Saturday on one count of attempting to provide material support to a foreign terrorist organization. He was ordered held until his next court appearance on Tuesday, the FBI said. A criminal complaint accused Tounisi of making online contact in March with a person he thought was a recruiter for Jabhat al-Nusrah, the militant Islamist Syrian group that the U.S. government calls a foreign terrorist organization operating as a wing of al Qaeda in Iraq. The supposed recruiter was an FBI employee working undercover, the agency said. Tounisi said in emails to the FBI employee that he planned to get to Syria via Turkey and was willing to die in the Syrian struggle, the complaint said. Syria is in the grips of a civil war that began in 2011 as a revolt against President Bashar Assad and has killed more than 70,000 people. On April 10, Tounisi bought an airline ticket for a flight from Chicago to Istanbul. On Thursday, the undercover FBI employee gave him a bus ticket for travel from Istanbul to Gaziantep, Turkey, near the border with Syria, the complaint said. Tounisi's attorney, Michael Madden, of the federal public defender program could not be reached for comment. Tounisi faces a maximum of 15 years in prison if convicted. The 2012 arrest of Daoud, 19, also involved his alleged communication with an undercover member of the FBI. The fake bomb that Daoud tried to detonate outside a Chicago bar was provided to him by an undercover FBI agent, authorities said. Daoud was indicted on two counts of attempting to use a weapon of mass destruction and maliciously attempting to use an explosive to destroy a building. He pleaded not guilty in October in federal court. Syria's President Bashar Assad, right, attends an interview with Syrian television channel al-Ikhbariya in Damascus, in this handout photograph distributed by Syria's national news agency SANA on April 17. President Bashar Assad accused the West on Wednesday of supporting al Qaeda militants in Syria's civil war and warned they would turn against their backers and strike "in the heart of Europe and the United States." Assad also launched his strongest criticism yet of neighboring Jordan for allowing thousands of fighters to cross the border to join a conflict he insisted his forces would win and save Syria from destruction. "We have no choice but victory. If we don't win, Syria will be finished and I don't think this is a choice for any citizen in Syria," the defiant president said in a television interview. Assad's forces have been fighting back across the country against rebels who have taken control of much of rural Syria and seized a provincial capital in March for the first time in two years of fighting. The conflict started with mainly peaceful demonstrations but descended into a civil war in which the United Nations says at least 70,000 people have been killed. 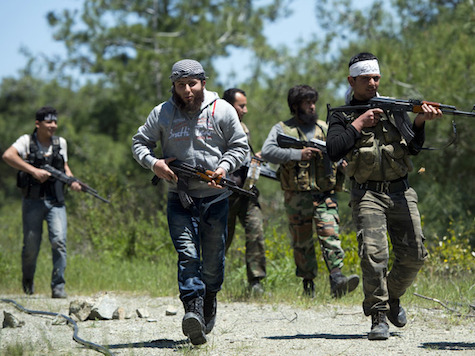 Islamist militants have emerged as the most potent of the anti-Assad rebels. Drawing parallels with Western support for anti-Soviet fighters in Afghanistan in the 1980s, some of whom later formed the al Qaeda organization which attacked the United States in September 2011, Assad said Washington and Europe would regret supporting rebels in Syria. "The West paid heavily for funding al Qaeda in its early stages in Afghanistan. Today it is supporting it in Syria, Libya and other places, and will pay a heavy price later in the heart of Europe and the United States," he told al-Ikhbariya channel. "The truth is, what is happening is that we are mainly facing extremist forces," Assad added. He was speaking a week after Syria's rebel al-Nusra Front, one of the most effective rebel forces battling his troops, formally pledged allegiance to al Qaeda leader Ayman al-Zawahri. The United States has designated the Nusra Front a terrorist organization and has sought to bolster rival rebel forces to counter the influence of the Islamists, training fighters in neighboring Jordan and allowing arms shipments to them. In some of his toughest comments against Jordan, Assad said Syria's southern neighbor had allowed thousands of fighters with military gear to cross into Syria to join the fight, and warned that the conflict could spread to Jordanian territory. "The fire will not stop at our border and everybody knows that Jordan is exposed as Syria is," he said. He said Syria had sent a security envoy to Amman in recent weeks to inquire about the fighters and reports of rebel training camps but he was met with "complete denial" of any Jordanian role in either issue. The United States will send 200 troops to Jordan in the coming weeks to help the kingdom boost its defenses in the face of a "deteriorating situation" in Syria, Jordanian Minister of State for Information Mohammad al-Momani told Reuters. Rebels say U.S. officers in Jordan have been training groups of anti-Assad fighters from Damascus and the southern province of Deraa - where fighting has intensified in recent weeks and rebels have made gains. "It's not possible to believe that thousands enter Syria with their gear (from Jordan) when Jordan is able to stop or arrest a single person carrying a simple weapon for resistance in Palestine," Assad said. Ghassan Hitto, speaking to reporters after his March 18 election as Syria's interim prime minister. He is a “straight shooter” from Texas who worked as a telecoms executive until November. But Ghassan Hitto now finds himself the presumptive caretaker-leader of Syria as world powers plot the end of Bashar Assad’s crumbling regime. The American citizen, born in Syria, is the new prime minister of the opposition’s interim government – the apparatus that the international community hopes will seal the end of Assad’s rule. Friends describe Hitto, 50, as “sincere” and “practical,” but the charismatic technocrat will need all the charm he can muster to unify Syria’s fragmented opposition. His rapid rise has prompted questions about how the deadly conflict should end and has cast a light on infighting, fueled by regional countries purportedly supporting certain opposition figures. The Free Syrian Army, one of the key rebel groups fighting Assad’s forces on the ground inside Syria, responded to Hitto’s appointment in Istanbul on March 18 by refusing to recognize his authority. “He’s a straight shooter, very sincere, very well-regarded and a very active community person,” said Carroll, who is director of the Houston chapter of the Council for American-Islamic Relations. Seen as Muslim Brotherhood's pickHitto, a father of four, lived in the U.S. for three decades, most recently on the outskirts of Dallas working as director of operations for telecoms supplier Inovar, where co-worker Arshad Syed remembers him as "honest" and "personable." He left Syria in the early 1980s and received an MBA at Indiana Wesleyan University on top of a degree in computer science and mathematics from Purdue University in Indianapolis. Strongly active in community groups, he was a member of the board of directors at the private Islamic school Bright Horizons Academy, in Garland, Texas, where his wife Suzanne still teaches English. In November, he made the decision to get involved in the National Coalition for Syrian Revolutionary and Opposition Forces -- the international grouping that seeks to end Syria’s civil war on the condition that Assad is removed from power. “Like a lot of people living away, he just wanted to help his homeland,” said Carroll. Hitto, a respected technocrat but an inexperienced politician, won the overwhelming number of votes from those who cast a ballot -- other possible candidates that included a former Syrian regime official -- but some members of the Coalition boycotted the vote in protest at the process. Not everyone was convinced the opposition needed an interim government, seeing it as yet another organization that could compete for control of a post-Assad Syria. Official spokesman Walid al-Bunni walked out of the vote in protest and Moaz al-Khatib, president of the Coalition, resigned and had to be persuaded back on board just in time for the Arab Summit in Doha, which began Tuesday. “Hitto’s whole role has been undermined from the start,” said Christopher Phillips, associate fellow of the Middle East and North Africa Programme at U.K. think tank, Chatham House. Represents 'the some of the some'Salman Shaik, director of the Brookings Center in Doha, said many Syrians "still regard the appointment of Hitto with suspicion." Even if Assad is toppled from power, Hitto is by no means certain of the authority he needs to implement free and fair elections. Yasser Tabarra, the Chicago-based legal adviser to the Coalition, says the interim government will focus on managing the 60 to 70 percent of the country that is liberated and controlled by opposition rebels. The government would coordinate local management efforts, including establishing law and order, and delivering basic goods and services, Tabarra said. Two key stumbling blocks remain: whether the Coalition should enter into any form of negotiations with the regime while Assad is still in power, and whether Hitto, an ethnic Kurd viewed as the Muslim Brotherhood's favored candidate, can unite the ideological differences between its liberal and Islamist members. In his task, Hitto at least has the backing of the U.S.
“This is an individual who, out of concern for the Syrian people, left a very successful life in Texas to go and work on humanitarian relief for the people of his home country,” said State Department spokeswoman Victoria Nuland after Hitto’s election. NBC News' Becky Bratu contributed to this report.